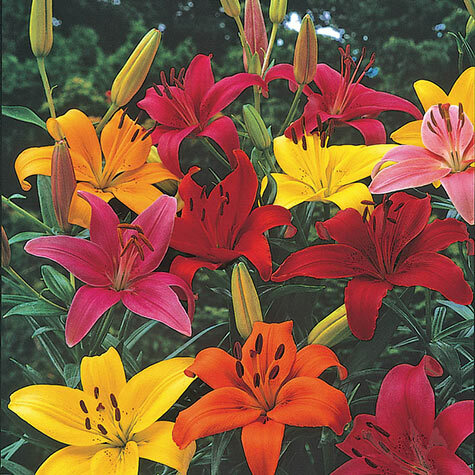 Bright and Bold Asiatic Lily Mix | Gurney's Seed & Nursery Co.
A sure bet for the late-spring to midsummer garden. Colorful, upward-facing blooms and tall, sturdy stems(40-48 in.) stand out in a border and are ideal for cutting. Plant in sun or partial shade; multiply annually. 12-14 cm bulbs. Zones 3-8. Foliage: Medium green foliage on tall sturdy stems. Blooms: Late spring to mid summer. Comments: A beautiful blend of yellow, orange, red and dark pink Asiatic Lilies for vivid color in midsummer. Sure to create an eye-catching display in borders and in bouquets. Grow 40- to 48- in. tall in sun or partial shade. 12-14 cm bulbs. Zones 3-8.